All along the Gulf Coast, you can find nature in its sweetest splendor. So, it’s only natural that you would stumble upon a place that focuses on natural wellness. Felicia McQuaid came into the holistic healing business quite naturally, indeed. 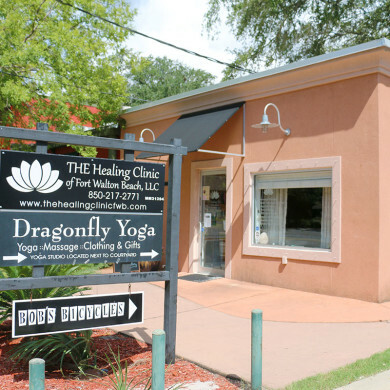 The owner and director of the Healing Clinic in Fort Walton Beach discovered holistic medicine on a personal journey. When conventional doctors were unable to diagnose the cause of her unmanageable back pain, she found herself wondering what to do next. That’s when she began researching yoga, meditation, and alternative methods of dealing with pain. “When I started yoga, I began to feel better in all ways … my body was experiencing less pain, my mind less anxiety and my soul realizing there was more going on in me,” McQuaid says. It was a major turning point in her life that would affect the lives of countless others she helps today. The relief McQuaid found inspired her to study these modalities and, fifteen years later, she is still sharing these gifts with her clients. Holistic therapies are not a replacement for conventional medicine, but rather an enhancement, she says. They take a different approach, emphasizing self-care and the realization that in order to be well, we must address all aspects of life and who we are. The Healing Clinic is the place to discover new connections between your mind and body, whether you’re on vacation or you live in the area. No two treatments are the same. In fact, each time you come in, you will discuss where you need help and where you are seeing progress. The Healing Clinic specializes in Theta Healing, Angel Therapy, Light Therapy, Private Yoga, Reiki Therapy and Training, AquaChi Detox, and Massage Therapy. But this isn’t your average massage. All therapists are trained and certified in Energy Therapy, along with the integration of Young Living Essential Oils tailored to each client. With a full lineup of events and workshops designed to illuminate your life, the Healing Clinic’s ultimate goal is to assist you in getting well and staying that way. McQuaid understands that some people are reluctant to try a new approach to healing, but she believes holistic treatments can add a whole new dimension to your health – one that puts you in control. The Healing Clinic is located at 184 Brooks St SE, Fort Walton Beach, FL 32548. For more information, visit the Healing Clinic website or call (850) 217-2771.